This is 'medium rez' skin for the stock F-104G; I call these "medium rez", as it's only 1024 x 1024. There is no partucular nation attached to this skin; it's "Generic" (however, certain contries may have had different placards - these, again, are generic in nature). This is a "clean" skin, with no painted on markings, using all stock in-game markings (decals) - the decals ini will use whichever you choose (excepting USAF). This will allow skinners/decalers more latitude in creating country-specific squadron markings and such. The skin has a default start date of 1970; you can adjust as needed (again, a generic date of 1973 might be more accurate). Included also are updated data and loadout inis, with "Nation & Year Specific" mission profile loadouts (in particular Marineflieger anti-ship). Updated version of the AS-30 and Kormoran 1 missile are included, for MFG usage. As expected, the canopy operates with the Shift/0 key. 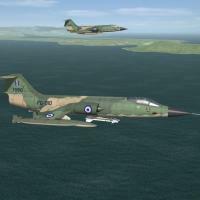 Since the skin mapping hasn't changed since SFP1, this skin should (may) also be usable in 1stGen game installs that have the F-104G accessable. This, however, has NOT been tested. As always, fairly easy to follow, detailed install instructions are included. So, please read them! !